Bombay is a rich city of contrasts. Its diversity is manifested in its collection of Western-style skyscrapers and historical buildings and temples. At Chowpatty Beach visitors will find the atmosphere festive and the bright fabrics and crafts tempting. 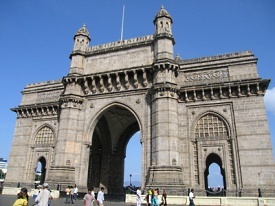 Tours also highlight the 1911 Gateway of India, the Prince of Wales Museum, Marine Drive, the Towers of Silence and the Jain Temple. Or take the launch to Elephant Island to see the sixth-century temples carved out of rocks. Indira Docks is located approximately an hour from Chhatrapati Shivaji International Airport. Leave the airport and turn right to stay on Sahar Elevated Rd for 2.6km. Use the right lane to merge onto Western Express Hwy, keep right to stay on the highway for 2km, then use the left 2 lanes to take the exit toward Hans Bhugra Marg/Santacruz - Chembur Link Rd for 1km. Turn left onto Hans Bhugra Marge/Santacruz - Chembur Link Rd for 1.5km, then turn right onto CST Road/Santacruz - Chembur Link Rd for 2km. Keep right to continue on Bangalore - Mumbai Hwy/Kurla - Kalina Flyover/Mumbai - Pune Hwy/Santacruz - Chamburg Link Rd for 4km. Turn right onto Bangalore - Mumbai Hwy/Ghatkopar - Mankhurd Link Rd/Jeejabai Bhosale Marg/Mumbai - Pune Hwy and continue straight until you reach Eastern Fwy in 1km. Continue onto Eastern Fwy for 15km, then take the exit toward Mansion Road. Continue on Mansion Road for 2km to Indira Docks.